70 ft Cruising Catamaran"Blue Pegasus"
Constructed in Cowes, England to the full American Bureau of Shipping approval for plans and building, this 70 ft. cat has been designed to the highest standard, for performance, strength, weight carrying capacity, and comfort. Mike Schicht was chosen to head the building team because of his extensive composite building experience using vaccuum bagged laminates. Mike has been involved in several large multihull projects including Colt Cars GB, Tektron 50 and recently the Blue Arrow America's Cup foiler. 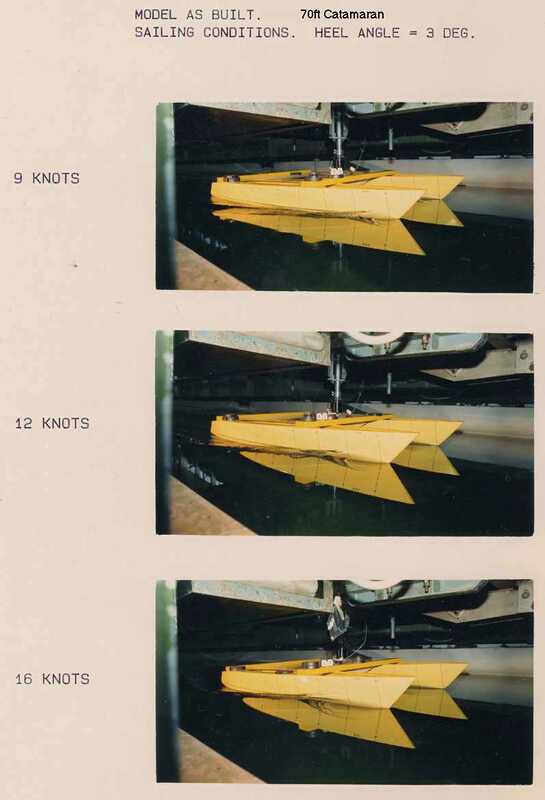 The results of the tank tests were fed into a Velocity Prediction Programme (VPP) and the polar performance curves were derived for the boat in various wind speeds. The results showed that a single daggerboard was the best option. 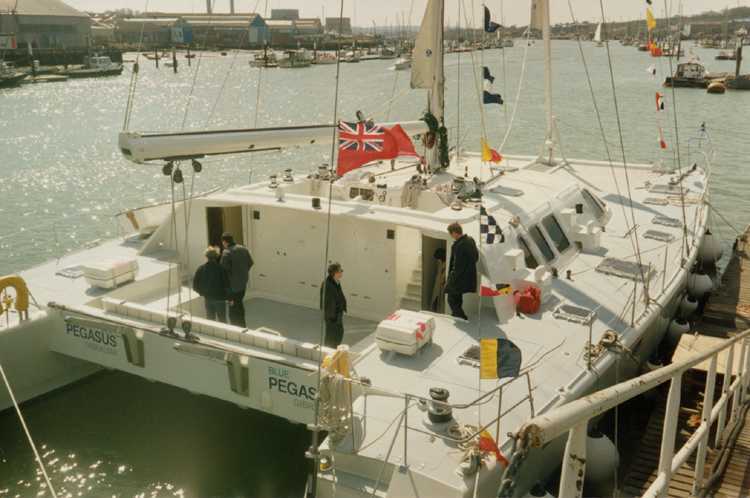 However as a compromise we decided to use two shallow keels to protect the rudders and propellers, and then to have one daggerboard in one hull to give extra lift upwind when needed. The shallow keels are also an efficient way of increasing the buoyancy of the hulls, thereby increasing the payload capacity. The accommodation plan has been developed from an earlier 65ft Cat design of ours, and interior styling is by Thanasis Papagianacos. The accommodation is vast by any standards, with 8 comfortable cabins for 4 crew and 11 guests, 4 toilets and showers, one with a full size bath tub next to the owners cabin. Separate dining room and saloon, huge galley with freezers, storage lockers for scuba gear and spares, a dog kennel, and a separate steering cockpit that will seat 5 in comfort. Sheets and lines are kept away from the main cockpit which measures 16 ft by 12 ft, enough space for 20 to dine under the stars. The boat has many well thought out features, such as the clear ports in the hull bottom for viewing fish or reefs, and for spotlights to light up the water around the boat at night. The aft underwater ports also allow inspection of the propellers. Hatches in the front of the steering cockpit allow communication between the steering cockpit and the galley or navigation area. Large anchors are permanently stowed in moulded recesses in the bow of each hull leading back to electric windlasses on the foredeck. Propulsion is 2 x 200 HP turbocharged diesels giving a speed of 14 knots. With a fuel capacity of 3.5 tons, and water of 4.5 tons she could motor or sail across the Atlantic comfortably in 10 days. The rig is basically a sloop, with a staysail for storm sailing. Both the main and jib are electrically furled, and with a working sail area of 2350 sq ft she should be capable of sailing steadily at 18 knots on a reach. I believe that good sail carrying power is essential on any cruising boat, particularly one with a bridgedeck saloon. 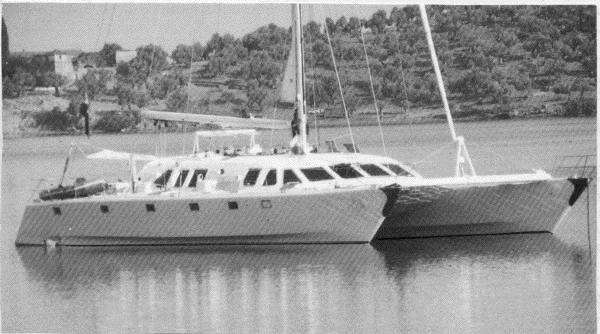 The aerodynamic drag caused by the large frontal area of this type of multihull, requires a large sail area to drive the boat to windward. Currently we design the coachroof as streamlined as possible, with the aid of a computer, but the next step is to test several models in a wind tunnel, research which we hope to complete by January 1990. Construction is in a balanced Kevlar and E glass fibre unidirectional cloth, supplied by SP Systems to our specifications. The resin system is SP Systems Ampreg 25. The laminate, core density, and thickness varies throughout the hull and bridgedeck structure to obtain the optimum strength to weight ratio. Carbon fibre struts in the main bulkhead under the mast, and in the aft beam under the mainsheet track ensure that the boat will be very stiff despite the large overall beam. In order to prove that the materials were performing to specification, and to confirm the computer designs of the laminates, an extensive materials testing programme has been carried out at the Westland Aerospace facility in Cowes both for our own and the ABS requirements. We wrote our own computer programme to optimise the laminates for ABS approval, otherwise it would be too easy to overbuild the boat, and end up with a heavy slow large multihull. The rudders are built in carbon fibre, mainly because in order to meet the ABS standards for the rudder stocks we would have had to use 330 lbs of stainless steel, whereas the Carbon stocks weigh 45 lbs each. Great care has been taken to save weight throughout the design. For instance all the interior panels are in lightweight foam sandwich panels made in a press, with colour already in the resin to save painting. Every item that is going into the boat is being weighed and a proper record kept. Ultimately all this effort and care in the designing testing and building should result in a very special new yacht, which will be able to make very fast economical ocean passages in great comfort and safety. The shallow draft will open up new cruising grounds not normally available to such a large vessel. We are now prepared to design even larger composite cruising multihulls. I believe that these materials are by far the best for long term fatigue, and high strength applications. Proper use of CAD programmes for structural design, coupled with materials testing for accurate input into the programmes, allows us to design very strong structures to meet the complex array of loadings experienced in a yacht of this size. Significant savings in cost of construction can be made by careful engineering, and the saving in weight will make the power requirements so much more economical. I believe therefore that in the future we will see composite catamarans of 120 ft and more.